The Zero Tolerance 561 knife is a Rick Hinderer design that was announced at the 2011 Blade Show. 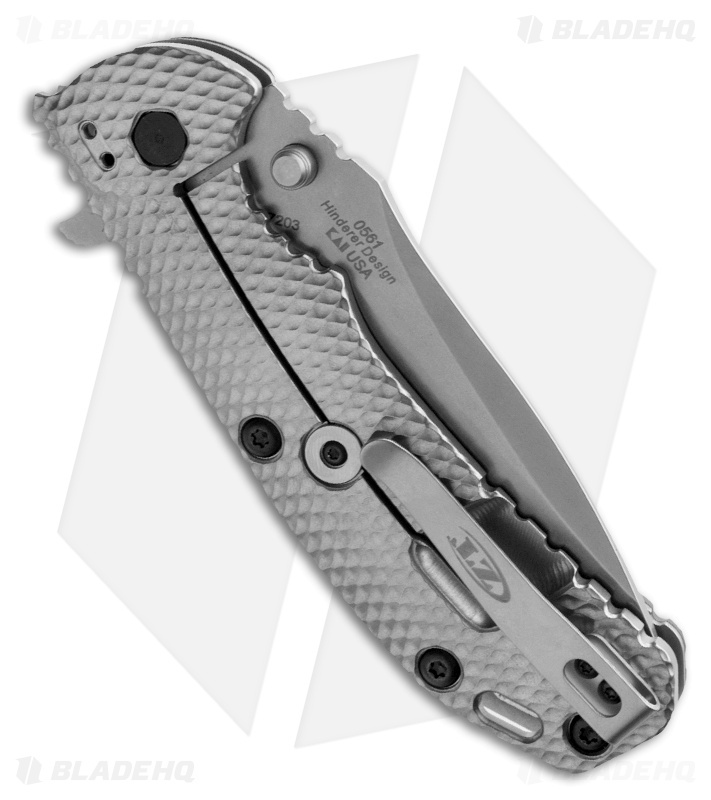 The 0561 features a premium stonewashed Elmax blade with a plain edge and ambidextrous thumb stud. 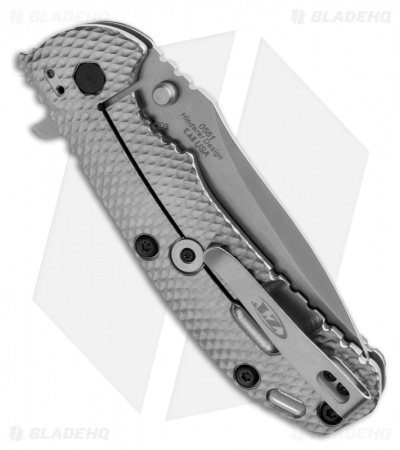 The handle has a 3D machined 6AL4V titanium frame-lock and a G-10 front handle scale. Includes pocket clip (tip-up). I purchased this knife soon after it was released by ZT, and it has spent significant time in my EDC rotation since then (4 years at least). I have recently been carrying it daily for the past six months, and I have to say there is nothing that I do not love about this knife. The deep carry makes it all but disappear in the pocket, the pivot is as smooth as butter, and the lock up is early and solid. Beefy enough knife to do heavy duty work, but with a cobra stitch paracord lanyard, rapid deployment from the pocket makes it a world class defense option. The ELMAX is good, and it pre-dated the American version CPM 20CV. This knife is no safe queen, it was designed and built to be used and used hard. And that is what I intend to do for years to come. The flipper makes for a very fast deployment of a heavy stonewashed elmax blade. This is a big knife that feels like it can hold up to any condition. I wasn't to crazy about the backside being a different color but it has grown on me. Very sharp out of the box and you can tell its quality when you hold it. My First ZT and What a great knife to for the first one. so I got this because I wanted a XM-18 but just couldn't bring myself to spend $450 on a knife and then carry it. I would have just let it sit in the safe. With 5 safe queens already I wanted one that I could be proud to own and have on me. Mine is Number 10124. sharp out the box and solid feeling in the hand. I will say the detente is a bit tight and I read in the manual it needs to be "broke in" so we will see how it goes in the next few weeks. I was carrying a Paramilitary 2 sprint run with s35vn steel and the dark earth G-10 scales. The ZT 0561 is heavier and bigger in just about all dimensions so if you have the PM2 and it's at the limit of what you are willing to carry this might be a bit large for you. But if you don't mind gong just a bit bigger for just a little more money i.m.h.o. this is twice the knife. I love my PM2 and I will carry it in my rotation but as of now the 0561 has top billing as my personal favorite. as a Lefty it carriers great in the tip up left carry position and I had no problems moving the clip over. I love everything about this knife. Overall construction, fit and finish, deployment, lockup, ergonomics, blade material and design is excellent. If you are the kind of guy who likes to carry a practical and yet tactical knife, this knife is gonna be the one for you. I can't say anything bad about this knife as it's perfect in every respect. What a beast of a knife! The ZT 0561 is truly built like a tank! 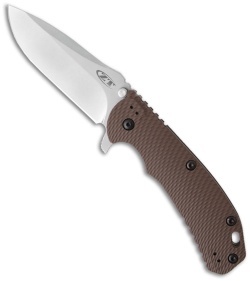 Is that a ZT in your pocket, or are you just happy to see me? It's big, but well balanced. And the blade shape is exquisite. There's a solid feel of quality and precision in the deployment of the blade. The only downside is the stiffness of the detent, where initial flipper action is tight. I've had the knife for a week. In that time I've worked with it to break it in. But my index finger is tender from all that stiff flipper action landing on the aggressive gimping. I'm considering sending it to KAI to see if something can be done to ease the detent. I'm wondering if the hole in which the detent rests can be slightly reamed and polished to relax the forces needed to overcome the detent and flip the blade open. I'm also considering lightly sanding one facet of the gimping, the corners facing the flipper, to make a smoother surface for my finger to land on. Just received this piece from blade hq, an man it's just perfect! Fit and finish was as good as any production knife I've ever seen/used. The zt box it came in says built like a tank and I believe it and then some. It's a solid larger(ish) knife with some heft behind it that screams quality. Perfect lockup, no blade play what so ever. It was a bit stiff for a little while but loosened up quite well and now as smooth as silk. The most important part is the actual blade and its hair popping sharp out of the box. Couldn't be more satisfied for a blade that will see daily and hard use I'm sure for years to come. Definitely a user no safe queen here! I ordered this knife on Wednesday received it on Friday using economy shipping. Very well made. The CNC milling is immaculate. The clip is a little tight but is expected with a new piece of equipment. Yes, it is a heavy knife but it's mostly blade weight. Blade hq is a great place to buy great knives at great prices. Amazingly smooth. When unlocked but open the blade falls freely without any shaking. It's so smooth you'd think it would have to have a quarter inch of play, but it has none. It's "Bank-Vault" tight. No wrist action needed for the opening. The steel is great and keeps a fine edge. the ONLY problems I had with mine is that the bottom screw holding the pocket clip on came stripped & the lock is just the tiniest bit sticky.. But for sure.. 5 stars. One of my favorite manual flippers. This is a sweet, practical, well-made, tactical EDC. This flipper has such smooth action, wrist movement is not needed with index finger deployment. Ergonomics of the handle are perfect. If anything, too much jimping. Suitable for heavy duty, military, or personal protection. Small pocket clip and deep pocket carry are perfect. Authoritative opening and zero blade play gives this puppy 5 stars. This has the easiest titanium frame lock to release with one hand. This knife is Americana at its best. Cheers to ZT for another quality product. One small issue: the opening is so sweet, the thumb stud works as good as any, and better than most - when using the thumb stud, the flipper could catch your index finger if held too close to the pivot. All things considered, this ZT is near perfect and a favorite in my collection. Love the knife. It is big in my pocket and carries very well with the deep carry clip. I use this knife constantly to cut anything needing cutting, even thin wire, and it has never let me down. I like it so much I've purchased a new scale to dress it up a bit. The only frustrations I have are the bearing system and the lockup. While it is flawless and smooth when clean, let a little dust and lint get into the bearings and this knife squeaks. It is easy to clean but be sure you keep care with the bearings out. They are not sealed and can be lost. The lockup is probably the most frustrating aspect to me. It is extremely hard to open the frame lock to close the knife. I get about 90% lockup on the blade and it takes a finger-smashing amount of pressure to unlock it. Aside from these two issues I love the knife and I'm certainly glad it is in my collection.